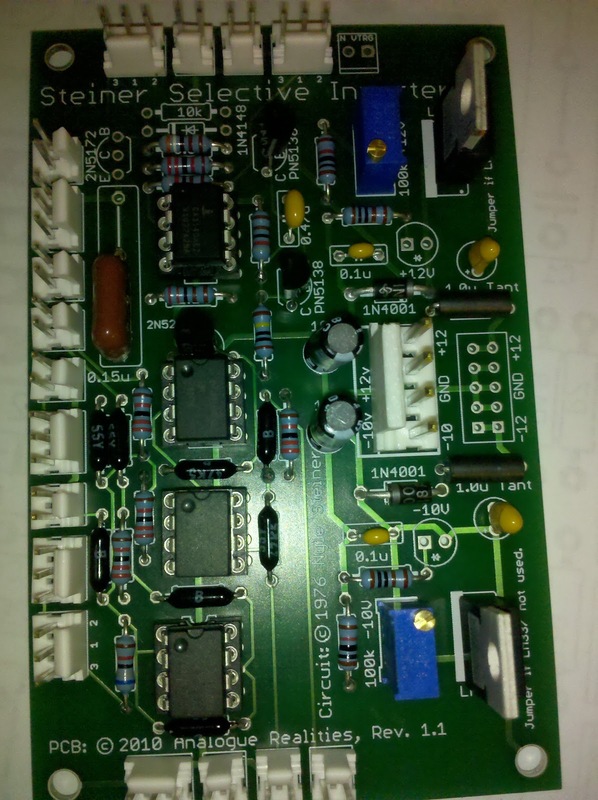 The Selective Inverter is one of the more unique Synthasystem modules. There's really two parts to it: the voltage processor, and the inverter. 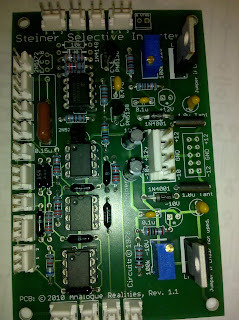 The voltage processor is actually quite similar to the Voltage Processor/Mixer but simplified a bit. There's three pairs of inputs (each pair having one attenuated and one non-attenuated) and an offset voltage (again, -10/+12V range). One of the input pairs is inverted, the other two are not. In a pinch you can use this module as a voltage processor, and the "A" output will always be the voltage processor output. The "B" output, though, is where the magic happens. When the mode switch is set to "Fixed" the "B" output will be the inverse of "A", and any trigger signals will be ignored. When the mode switch is set to "Select" and there's no trigger input (via the push-button switch, the jack, or the pedal input), the "B" output will be the same as the "A" output. However, apply a trigger and "B" will be the inverse of "A" with respect the voltage when the trigger was applied. If you're as confused as I was originally, let's try it with an example. Say we have a repeating stair-case sequence: 0V, 1V, 2V, 3V, 4V, 5V, 0V, ... Without a trigger, the A and B outputs will be the same. But, imagine a trigger is applied when the sequence is at 2V: the "A" output will continue on its merry way with nothing changing, but the "B" output will now be: 4V, 3V, 2V, 1V, 0V, -1V, 4V, ... (with the two sequences intersecting at 2V). There's three sets of resistors that need to be closely matched; I've used 47k 0.1% tolerance resistors. The 0.15u cap should ideally be polystyrene, but this is impossible to find, so I've used polypropylene. It also uses one CA3140 - just remember that it is there, so you don't accidentally throw another LM741 in there. Note too that R15 (one of the summing resistors) should be 22k, not 22R (it is a typo on the PCB). Also, I've omitted the V-Trigger components, and will do so on future modules. I'm far enough along in this project where I can't see myself switching away from S-Triggers, so there's no need to waste all those transistors and other components.